The wrap around porches, large shade trees and weathered look of Callahan’s of Calabash is so inviting. You’ll want to stop and explore all the rooms and nooks and crannies of this sprawling gift store – all 35,000 square feet. It’s coastal living decor at its finest with a wide selection of art, handmade sailboats and even brass bells. 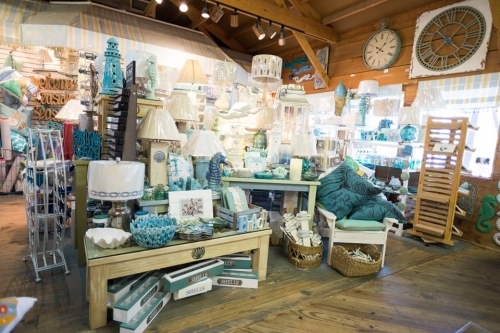 Take a little of the beach home with you when you shop at Callahan’s of Calabash. Within the walls of Callahan’s you’ll find the St. Nick Nack’s Christmas Shop that features millions of Christmas ornaments, which makes Christmas decorating fun anytime of year, and the Fudge Co. that smells as sweet as it sounds – dozens of homemade fudge flavors, handmade candy and saltwater taffy. And the Pea Landing Mercantile pays homage to what the area was called before being named Calabash. Here the selection of garden decor, linens and ceramic home decor will occupy some of your time. Open daily.